CALGARY - One of the players in Calgary's gangland skirmishes over the past decade is turning on his former associates in exchange for an agreed sentence of 16 years. Michael Roberto pleaded guilty Thursday to five charges of conspiring to commit murder and committing murder for the benefit or at the direction of a criminal organization. He admitted to walking into Calgary's Bolsa restaurant on New Year's Day 2009 and fatally shooting rival gang member Sanjeev Mann. Another gang member, Aaron Bendle, and innocent bystander Keni S'ua were also killed in the Bolsa shooting, one of many involving the criminal gang FOB and its sworn enemies, the FOB Killers. 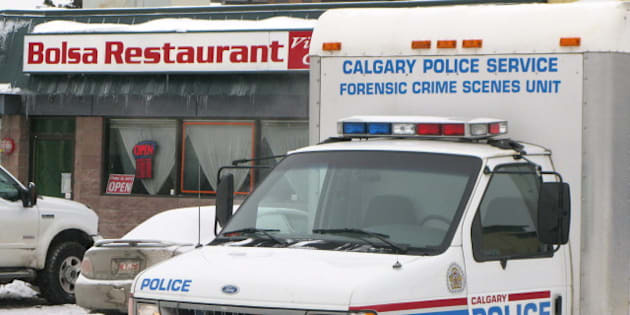 Last week, Calgary police said that after a five-year investigation, they had charged five men with the slayings of six people, including the three at the Bolsa restaurant. Crown prosecutor Brian Holby characterized the plea bargain with Roberto as "a deal with a devil" but said there was no choice. "We did not have a reasonable likelihood of conviction for many of the charges that were laid last week until he co-operated," said Holby. "He was not prepared to co-operate with the Crown or with the police if he was forced to plead to first-degree murder and was sentenced to life imprisonment with no parole for 25 years. So as a compromise he agreed to plead guilty to a criminal organization charge, admitting the murder, because we thought it was important the truth come out." Roberto and Nathan Zuccherato had previously been convicted of three counts of first-degree murder in the Bolsa shooting, but those were overturned and new trials were ordered after new evidence came to light. Defence lawyer Paul Stern confirmed his client has agreed to testify against the others. With credit for time served, Roberto will have just eight years left to serve. "It's, of course, always difficult when you have somebody who's admitting ... to very serious crimes, receiving a sentence that could be viewed as being on the lower end, where some people would think a very harsh sentence should be imposed," said Stern. Zuccherato, 26, Nicholas Cypui Chan, 35, his brother Timothy Chan, 32, and Dustin Duke Darby, 30, are also charged in the 2008 shooting of Kevin Steven Anaya, 21, who was the victim of a drive-by shooting while walking to a home. Zuccerato and Van Thoai Luc, 25, are also charged in the deaths of Tina Kong and Kevin Ses, who were shot at a restaurant while eating with two friends that same year. Police say Ses was a loose associate of a gang member but Kong had no connection to illegal activity. Real Honorio had previously been convicted of first-degree murder in the deaths of Mann and Bendle and second-degree murder in the death of S’ua. His conviction is under appeal.